Custom Imprinted Bumper Stickers, Printed, Promotional. Qty./ Price Per Piece on White Zip-Strip® Vinyl (ultra removable adhesive). Order your bumper stickers Now!, click here. Copy/Color Change: $32.50 per color affected in multiple of the minimum quantity. Copy and color changes can not be combined on the same order. Item, colors, and size must be the same with all changes received at one time. No Color Match (PMS) available for items 412, 415, or 417. All prices, quantities, designs and/ or colors are subject to change without notice. HD Resolution/ Full Color Bumper Stickers available. Please call Customer Service for prices. Minimum Qty. is 250 per order. Copy and color changes can not be combined on the same order. Item, material, colors, and size must be the same with all changes received at one time. Color Match (PMS): $41.00 per color. No guarantee of perfect matches. Face Slit and Hole Punched Bumper Stickers available. Please call Customer Service for information. • For direct mail campaigns. 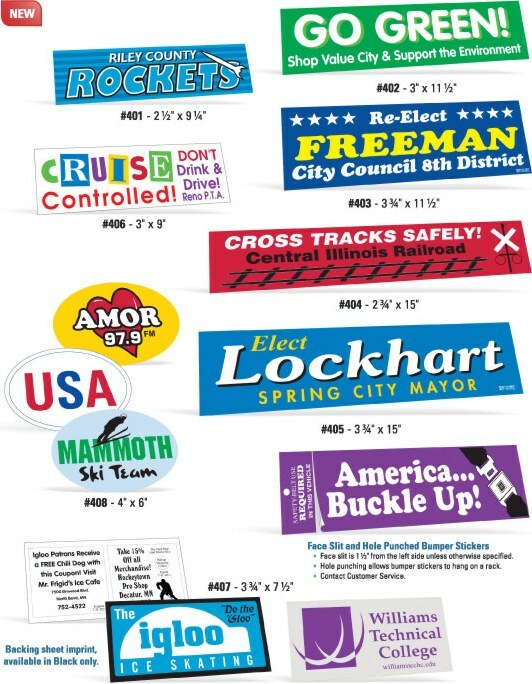 • Bumper Stickers compliment any promotion or event. See color chart above for details, or give us your match color (and PMS #), or call to our customer service.Note: Neon colors begin to fade after 30 days exposure to sunlight. Ink Color Match (or PMS #): See price chart for details. Copy/ Design Change: See details above. Outdoor durable for 3-5 years. Neon colors begin to fade after 30 days exposure to sunlight. On all political orders unless otherwise requested. Drop Shipments: Shipments to multiple locations, all occurring at the same time : $10.00 for each item going to each location. (includes Canada). $20.00 per item for international. From receipt of complete order and approved artwork, please allow 10-12 working days production time in the plant on custom or imprinted merchandise, unless otherwise noted. Need it quicker? Contact us.